An MBA graduate or accountant that has a profound accounting and financial knowledge may be able to state a clear-cut distinction between the terms profits and profitability. For a businessperson, it is not that hard either. We know that any business stands strong in the market because of the profits it makes. 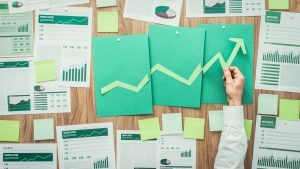 When it comes to business growth and expansion, these two terms play an influential role in defining what’s suitable and what’s right for a company—whether the financial grounds or bookkeeping records are favorable or not. One thing is very clear, regardless of size, businesses need to track their profit margin in order to make wise financial decisions that are important in strategic terms. Profit and profitability are two terms that are often used interchangeably, however, they are not the same. The interpretation of both terms is different and those who are able to interpret them correctly can expect to witness financial success of a company. To determine whether a company is financially sound or not, business owners and investors need to track the company’s profit from its profitability. To keep the business afloat, you need to ensure a smooth working capital and cut business costs and expenses as much as possible. In simplest terms, whatever amount is left after subtracting the total expenses from the total revenues is profit. Similarly, the profit margin is the ratio between the net income and total sales as it is measured as a ratio or percentage. If we go deep into the application of calculating a company’s profits and you are a professional accountant or bookkeeper, it won’t be hard. You need to sum up or add the total revenues and subtract the total expenses to get the amount of total profit. The point is, profit is an absolute term and we have a simple formula for calculating it. When we evaluate the term in a business perspective, we know that a company’s core objective is always to make a profit. Without making a profit, no company can survive in the market for long. Obviously, what is earned is invested back into the business and a company will grow slowly and gradually. But, the point is, profit alone as a measure of success can be deceiving. There are different routes to calculating a profit margin and business owners need to note minor cost shifts. The bottom line is, your income statement shows you whether you are making a profit or not. If the results are negative figures, you need to cut or readjust your business expenses or costs in order to ensure a profit. The application for calculating profitability is a bit more complicated than calculating a normal profit. It involves percentages or ratios which show that profitability is the measurement of profit. Business owners need to ensure that their profitability index is positive in order to yield enough profit to sustain and grow, especially when the market competition is intense. A business requires careful financial tracking and controlling.